Uniqua and Tasha are princesses who plan to break out of a huge tower. But can they do it without setting off the bobby traps made by castle guards Pablo and Tyrone? 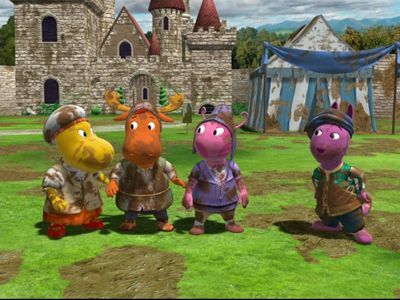 In order to keep the dirt for the Festival of Dirt in the village of Filthingham, Mayor Austin Stinkypants locks Tyrone, Tasha, and Uniqua's soap away in the dungeon so they can't get clean. Tyrone sets off through Purewood Forest in search of Pablo, the Robin Hood the Clean, so he can help them get clean once again. 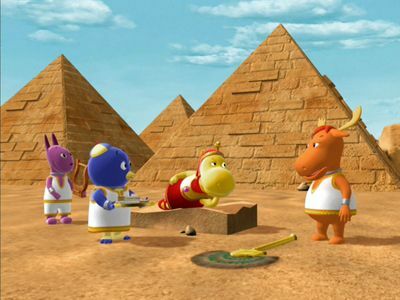 Princess Tasha and her servants must unlock the waters of the Nile and end Egypt's drought by bringing gifts to the Sphinx. 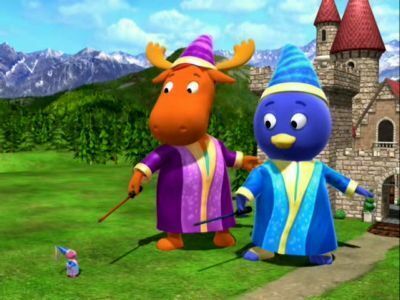 Uniqua and Tyrone are royal knights who are protecting King Pablo's egg. Grabbing Goblin Austin in Goblin Land and the Fairy Tasha want the egg for themselves. 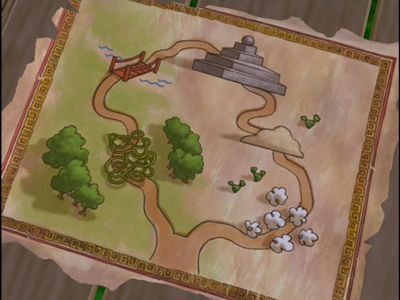 They follow King Pablo's egg to Dragon Mountain to retrieve it. 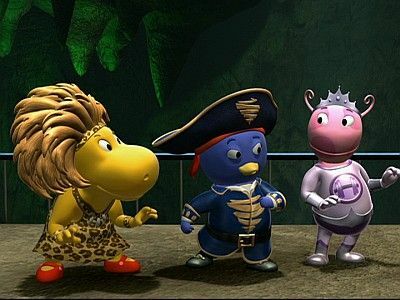 Uniqua, Tasha, Tyrone, and Pablo are Brave, Indiana-Jones-style Explorers, on a quest for the rare, legendary Flying Rock which sits atop Big Rock Hill. 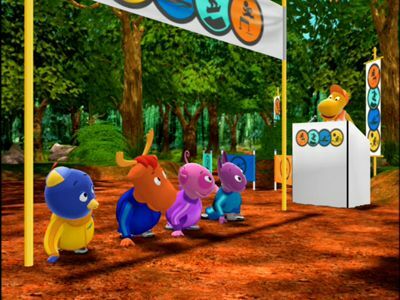 In a frenzied disco dash through the jungle and the desert, they race each other to see who can make it to Big Rock Hill first, and claim the prize. 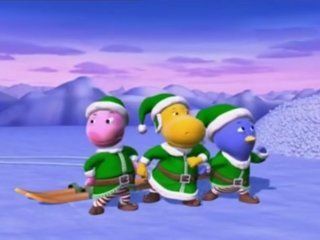 When the Backyardigans receive a strange signal originating from Mars, Uniqua, Pablo and Austin blast off to investigate. They're backed up by Tyrone and Tasha, who remain on Earth to assist at Mission Control. 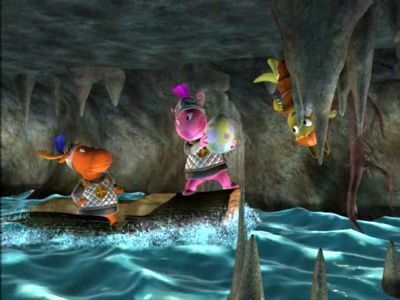 The Backyardigans leave prepared for anything, but encounter some surprises along the way. They don't give up, however, and eventually make a surprising discovery regarding the source of the signal. 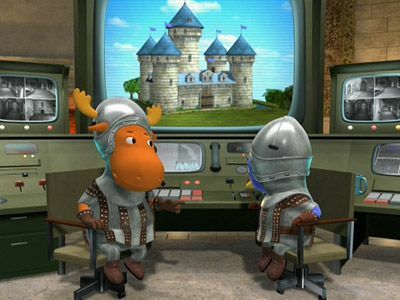 Uniqua and Tyrone, the hardnosed detective, set out to Monster's Castle where Pablo the soccer ball monster has taken Uniqua's ball. 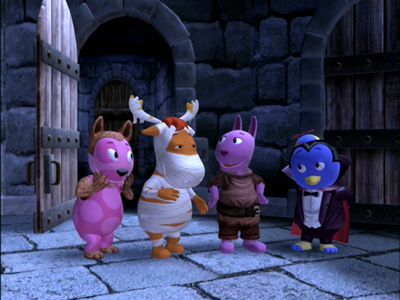 They must make it out of the castle before they get turned into monsters. 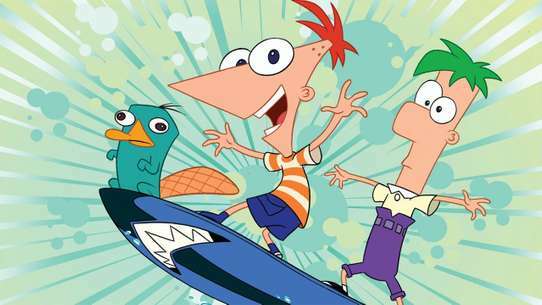 Scientist Pablo and his assistant accidentally use a growth formula on a worman. 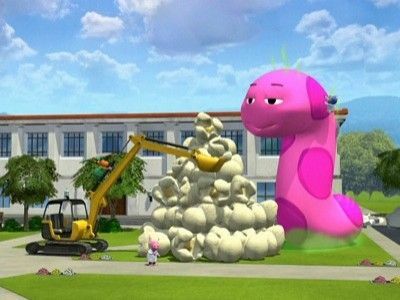 Now they need Groundskeeper Tyrone's help to stop the clumsy giant creature! 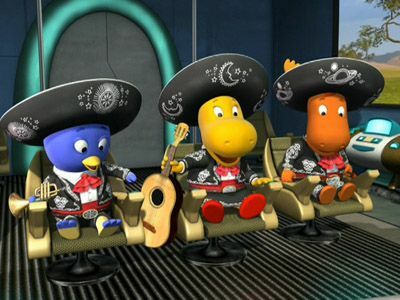 Pablo, Tyrone and Tasha are part of a Mariachi band that gets stuck in a rocket, which they mistook for their new tour bus, and are launched into outer space where they must stop the Googers (Uniqua and Austin) from taking over the earth. 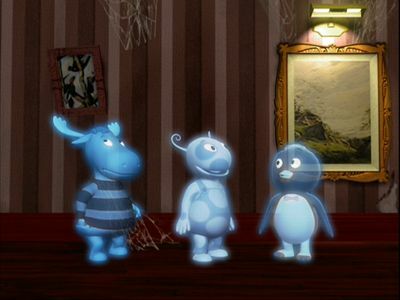 Ghosts Tyronne, Pablo and Uniqua practice being scary. Tasha is the "unsuspecting stranger" they choose to haunt. #12 - Who Goes There? Tyrone is the security guard at a huge art museum. Then some of the art (played by Pablo, Uniqua and Austin) come to life and start running all over the place. When Tyrone finds out about this, he must stop the art before the curator (Tasha) finds out about it. 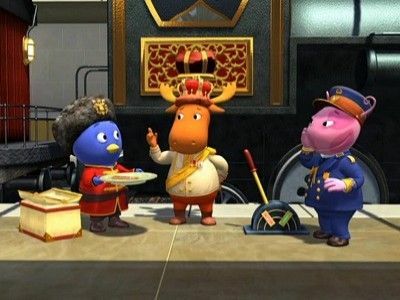 Queen Uniqua sends wizards, Tyrone and Pablo, out to get rid of Tasha, the giant. Tasha is new to the kingdom and is just looking for fun and new friends, but Queen Uniqua would rather take a nap. Before long, Tyrone and Pablo use a magic spell and manage to accidently turn everyone into giants. 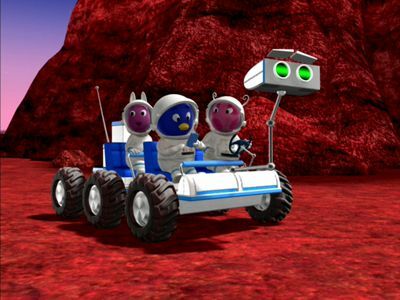 Inventors Pablo and Uniqua travel to the center of the earth in their earth burrowing rocket ship to retrieve Tyrone's lost lucky penny. It's racing day, and Austin is prepared. 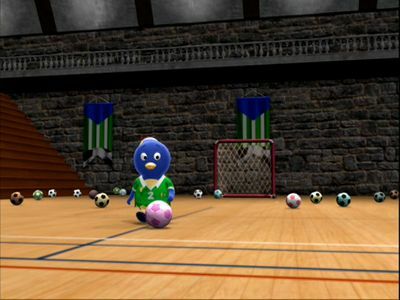 Unlike his friends (and competitors) Pablo, Tyrone, and Uniqua, he has never won a gold medal before. The referee (Tasha) starts the race, and Zydeco tunes spur them on as they dash around the globe. Who will be the first to break the tape at the finish line? 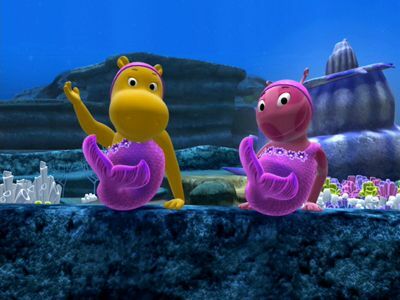 Pablo and Tyrone are deep sea explorers who are looking for a mermaid to take pictures of. 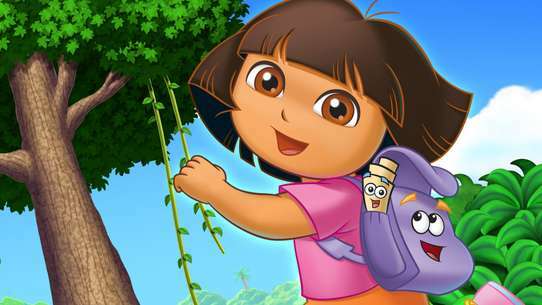 They find two, Tasha and Uniqua, who think they are being invaded and are going to be captured. 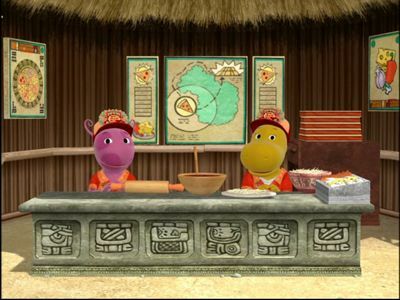 Uniqua and Tasha are Mayan pizza delivery girls, who set out on a mission across the pyramids of water, earth, and wind so they can deliver Tyrone the King a fresh hot pizza pie. Tasha, Uniqua and Austin work for W-I-O-WA News (The Corniest Station in the Nation), which is a news station that usually ends up reporting on corn. 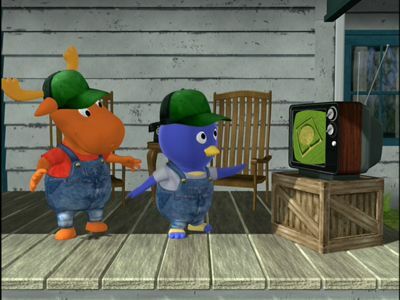 Tyrone and Pablo are corn farmers who are so happy with their crop, that they keep sending in reports just to get on the air, but unfortunately it isn't considered newsworthy. 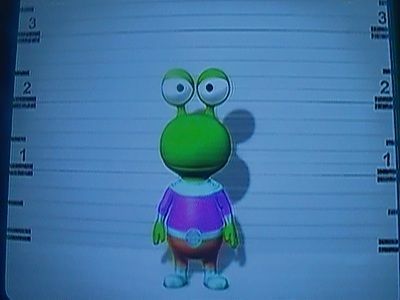 They decide to make up some stories about aliens visiting their cornfields so that the news team will come out to investigate further and put their corn crops on their air. 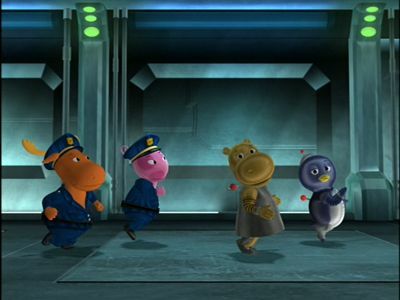 Tyrone and Tasha, the space police, have to arrest Blaarg (an evil alien) with the help of Uniqua and Pablo. Uniqua and Pablo are Swamp Tour Guides who promise to show tourists Austin and Tasha the Swamp Creature. 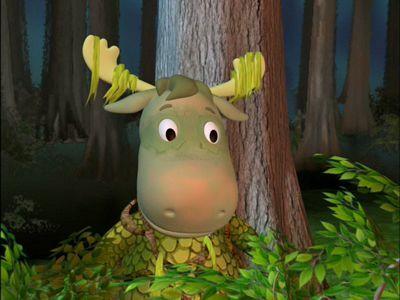 Little do they know there is a real Swamp Creature, Tyrone. Mad Scientist Tasha sends Austin to bring three monsters back to her laboratory. 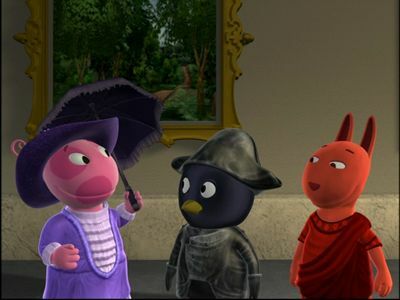 They are looking for Vampire Pablo, Mummy Tyrone, and Werewolf Uniqua. Ragtime music plays as Engineer Uniqua runs to catch the runaway Imperial train, when it leaves the station with no one driving and the Tsar of Russia (Tyrone) sleeping inside! Pablo the sportscaster and Tyrone the meteorologist, travel to Mt. Olympus in an attempt to change the mind of the goddess of weather, Tasha, and make what they said on their tv station come true by making the rain stop. Along the way Pablo teaches the god of laughter, Austin, and the goddess of naps, Uniqua, a few rad basketball moves. 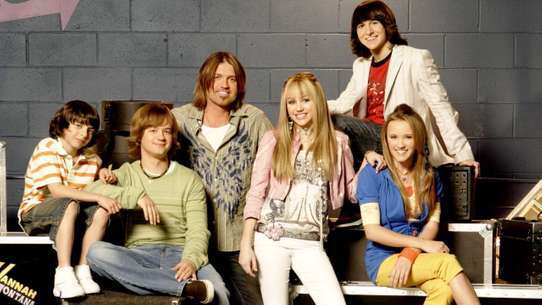 Soon they find out they need to win a baskbetball game against the goddess of weather in order to make the rain stop. #25 - Super Team Awesome! Tyrone is a tour guide for the world's only lava geyser.